"You Can't...Put A BULLET...In A NIGHTMARE!" COMICS! Sometimes Pleasures Can Be Dark Indeed! Thanks to the snow and the UK's inability to ever cope with it I got a bit of extra time (but not your...kisss!). 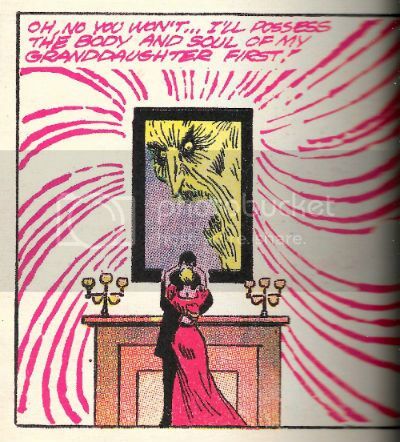 I'll have to make that time up mind you, but don't you worry about that, because here's a pitiful splatter of words about a collection of Tom Sutton's work on Charlton's "ghost" line of comics. I should probably tell you upfront that I liked 'em, because I know I can be a bit equivocal about this stuff. Oh, I loved this book. I loved this book so very, very much. This book is chock-a-block full of stuff I thought I’d never see, but stuff I always wanted to. And here it is and I’m seeing it! Oops, sorry. (Dignity in all things, John!) So, ahem, this splendid tome, from the hands of Michael Ambrose & Donnie Pitchford, contains reprints of a selection of strips and covers Tom Sutton drew (and many of the stories he also wrote) for the comics publisher Charlton's "ghost" line during the 1970s. I don’t think they’ve been reprinted since they first appeared, certainly not in bulk; I know they were all fresh sights to my eyes. Which isn’t surprising as even though, like all good 1970s children, I was gluttonous in my hunger for four colour papery entertainment, Charlton rarely formed part of that eye diet. Mostly this was down to Charlton comics being a sporadic sight in obscure North of England market towns like the one in which I festered. The other thing about Charlton comics was that when they did turn up they were so aesthetically displeasing even the least picky child was deterred. 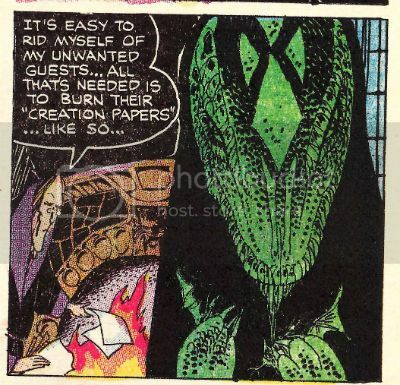 Charlton’s poor reproduction and unpleasantly tactile paper are the stuff of legend, but it’s a legend based in fact; they were poorly printed on weird material. When it comes to the company itself fact and legend get all mushed up so, although it sounds like a myth, it is a fact that the company was formed over a handshake in jail. Yet the stuff which sounds plausible, the stuff about how their comics were the result of penny pinching efficiency because the presses had to keep rolling 24/7, might be a legend (it depends whose “facts” you read). Mind you, on reflection “The presses must never stop! They hunger.” is all a tad Oliver Onions, non? Delightfully so. Then there was the flood which submerged the company under 18 feet of water in 1958 and I’ve even heard that the nightwatchman had a hook for a hand and strange lights came from the gents on Wednesdays. From this physical and temporal distance relying on other people’s accounts Charlton sounds not so much like a comics publisher than a haunted house. Or a cursed one at least. Where better for the work of an artist whose art is as sinister as that of Tom Sutton to infest? 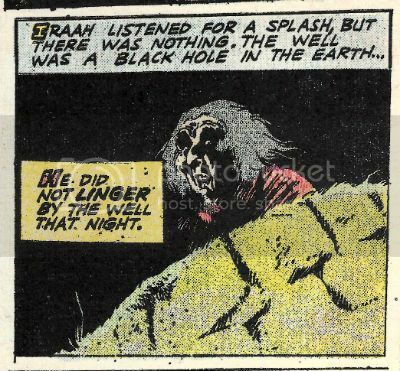 Obviously that creaky and laborious conceit all rather crumbles to dust in light of all the other comics Charlton produced but I’m trying to keep a creepy theme going and you’re making that hard with your insistence on facts. 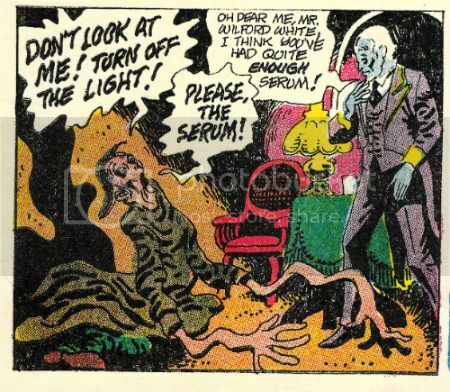 So, yes, okay, Charlton didn’t just produce horror comics they produced western comics, war comics, romance comics, super-hero comics (Blue Beetle, Captain Atom, E-Man), licenced comics; remember, the spice must flow; the presses must never stop. And Tom Sutton probably drew some of those, but they aren’t in this book. This book is all about his Charlton horror comics (For pedants: yes, there's one S-F and one "barbarian" but they all appeared in the "ghost" line of books). Sutton worked at Charlton for the same reason as Steve Ditko - they paid pennies but they left you alone. As long as pages were coming in they were happy, which meant what was on those pages was at the mercy of the artist. Artistic freedom, I believe they call it. 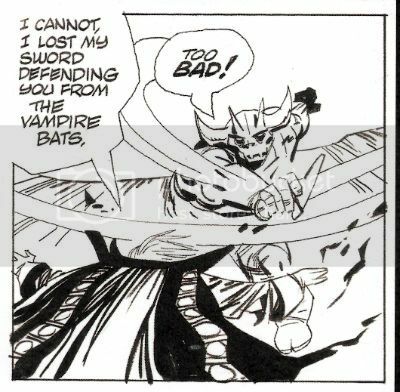 The results can vary depending on the artist (O God, can it vary; truly, it varies) but in Tom Sutton's (and Steve Ditko's) case the results were wonderful. Not so much because of the plots, which sound daft when torn from their visual context. 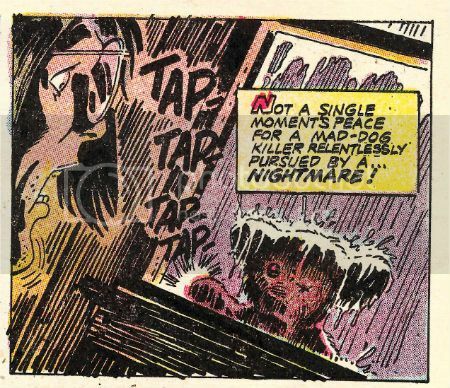 These artfully mottled pages contain a vengeful stuffed toy, a drunk and lonely ghost, an unfortunate marriage or two, a sea monster; basically a bubbling broth of all the rote , but fun, genre markers of horror of the 1970s. Yet Sutton’s art brutally lashes these mostly slender, and derivative (but sometimes original, to wit - a love story told from the POV of a grave) concepts to the end of their allotted pages and the results may leave your higher brain unruffled but your lizard brain will be skittering about like it sat on a hot rock. These strips leave hazy emotions lightly roiling in their wake as though something disturbed is moving around down there in the mud of your mind. Something angry;something hungry. I guess it is style over content, but in that good way Comics can carry off; the style is sometimes also the content. Mostly, the content fills while the style kills. So, no, it isn’t the killer teddy bear which unnerves; it’s the world of razor sharp lines and blooms of stygian black you inhabit while reading which goes quietly about its terrible work of suspending your disbelief by its ankles. Sutton’s work can sell the silliest or most pointless stories because the seriousness is in the art. So, yeah, it's a story about a blob in love with a robot but when Sutton draws it, you can tell he's all in. They are stories but sometimes only just; sometimes it's better to see them as wells of mood into which Sutton’s art pitches you. The unfathomable depths of Sutton’s blacks in which he couches his sudden lurches into intricately filigreed detail are not only how the tale is told, sometimes they are the tale itself. "Unscheduled Stop" doesn’t even make any narrative sense but for the duration I was rapt as Sutton starts with one of the most depressing grid pages I’ve ever seen, and by the second page he’s messily riffing on Krigstein’s "Master Race", and then it’s page layout blow-out time as the ghost of Poe directs the Universal creatures in a fantasmagoric dream melt. I had no idea what I'd just read but I knew it was great COMICS!!! On an aesthetic note, the reproduction of these Comics (and covers) throughout is pretty good. They are presented as was though, so be warned that they do look like old comics. There's no re-colouring or re-mastering or re-anything except re-sizing and reprinting going on here (as far as I can see). Where there is the occasional descent into addled muddiness it’s still within acceptable parameters, I think, for the privilege of seeing this work. For the most part, sized-up to magazine size as they are here, these pages have (probably) never looked so good. (They still essentially look like old Charlton comics though; I'm just making that crystal clear.) Better yet, there is a smattering of pages that also have never been seen (by the wider reading audience; obviously, someone saw them.) 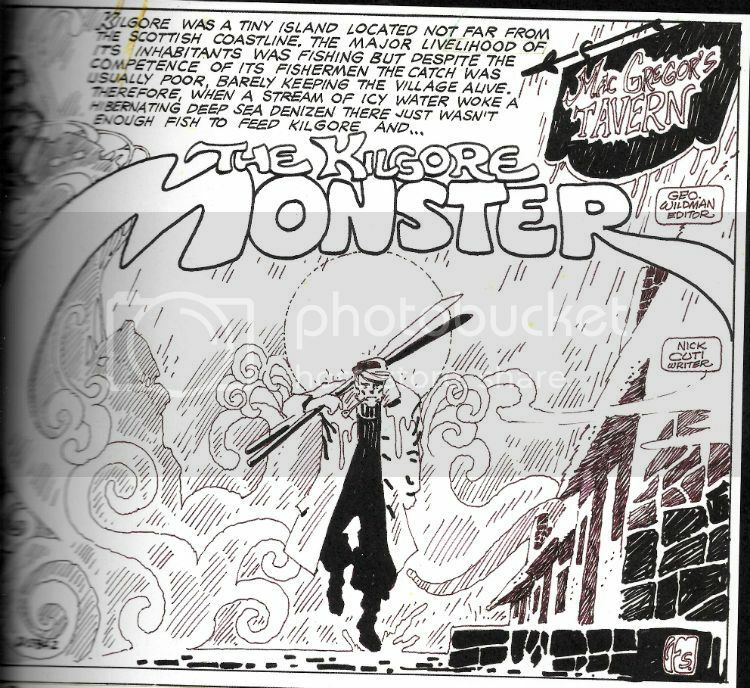 These pages take the form of the original art (from the collection of Michael Ambrose; cheers, Michael Ambrose!) and where possible these B&W reproductions have been used in place of the printed pages. Sutton’s often overlooked precision hits you immediately on these pages. The shittines of the above image is due entirely to my scanning ineptitude. In the book this is (as are all other such B&W pages) crisp and clear. So, anyway, often Sutton's precision is lost in the blurry printing and the sheer reckless momentum of his art, but not here. Consider the half page panel of a sailorman stumping forth from a fog. It could have been drawn any one of the current carriers of Sutton's strain of dark genius; it could have slid from the brush of Michael T Gilbert, Steve Bissette or Kevin O'Neil only yesterday. But it didn't, it was drawn by Tom Sutton in 1974. In 2015 I am still impressed with the apparent ease with which Sutton makes the background elements creepily cohere into a shape of Cthulloid menace. It's just one of Tom Sutton's Creepy Things and this book's bloated with 'em. VERY GOOD!